It was a gentle dive — an unexpected treat given surface conditions, which were windy and overcast, throwing up a reasonable swell and surf on the reef. Costa Maya, Mexico, was the last port of call on our western Caribbean cruise aboard the motor ship Ryndam of the Holland America Line. While I had heard of the “Costa Maya” in Mexico, I had never before heard of it as an actual port, so before embarking on the trip I checked out the tourism and sightseeing opportunities there. The reviews* were pretty unanimous: If you can, go snorkeling or diving; don’t waste your time on tourism by land. The ship docks at one of those “manufactured” ports; there is a small town nearby but the cruise ship dock is isolated and mainly consists of an enormous pier attached to a medium-sized duty-free shopping center (albeit with a large pool and several very nice bars and restaurants around it). Most visitors stay around the pool or shop in the stores. There are a couple of bus tours available, and there are diving and snorkeling excursions. So. Diving. The tour operator was Dreamtime Dive Centre in Mahahual (the small town near the artificial port created by the cruise lines at “Costa Maya”). The staff was friendly, with divemasters hailing from the US and England complemented by an excellent local staff. The dive center stands right on the beautiful white sand beach that runs the length of the town. Highly recommended; check them out if you ever get there. We boarded our dive boat in calm water at the beach, protected from the rising surf by the reef itself several hundred yards offshore. After a 15-minute ride through a gap in the reef, we were ready to drop in at a site called “the flames.” After a back-roll entry from the boat, we dropped about 45 feet to the top of the reef and then moved out over the gentle terrain to seaward. The visibility was good, the water warm, and the current negligible. We spread out over the reef. Soon I saw a pair of waving antennae under an overhang. I checked camera and strobes, drifted out away from the reef, moved slowly down a few feet, and then edged carefully back towards the reef. My arms were extended in front of me and I did my best not to move either camera or my body, relying on current and fins to move me very gently to the reef. 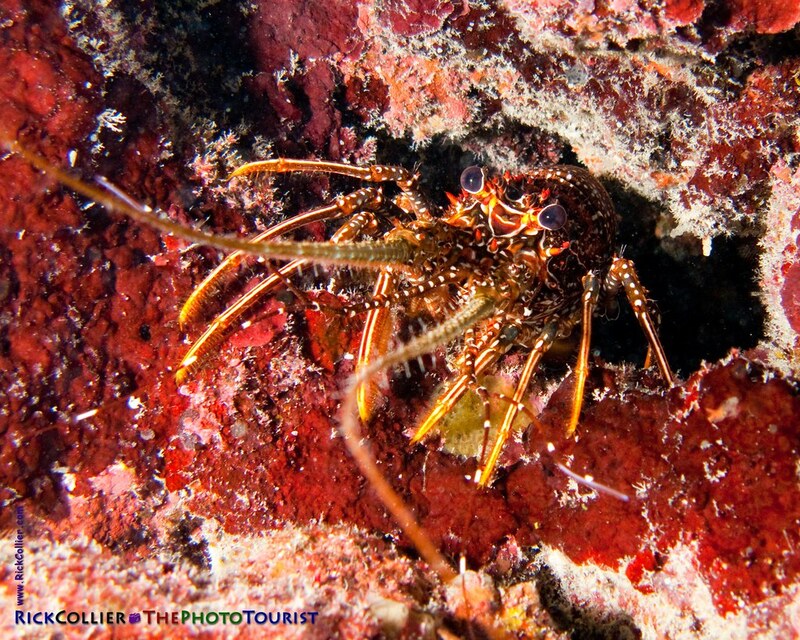 As my camera cleared a small outcropping, I saw this lobster edging tentatively out of a hole in the reef. I moved in steadily and slowly, eye on the prize. When approaching a Caribbean lobster, one needs to watch its antennae. The lobster will point at least one antenna directly at any intruder. The antenna is shell and comes to a point; I suppose it could do harm if pushed, but more often the lobster will bolt the moment either antenna touches anything. (They are often spooked by incidental contact completely unrelated to the diver — or perhaps a water movement the diver caused.) These bugs can be amazingly fast when they want to escape, and this one already had a hole right there. I got as close as I dared, then fired. The strobes flashed, and the little treat was gone, leaving only a hole with the tips of antennae sticking out of it. * Before cruising I usually check a lot of web sites and always also do general Google searches to find other perspectives. If considering diving, I always check the fantastic and knowledgeable community at ScubaBoard.com. For destinations, I always use Tripadvisor.com, and for cruise ports of call there is Cruisecritic.com. Peekaboo is a post from: thePhotoTourist.com. This entry was posted on Monday, April 12th, 2010 at 17:41 pm. It is filed under thePhotoTourist and tagged with Caribbean, coral, Costa Maya, cruise, cruise critic, cruisecritic, dive, diving, Dreamtime, Dreamtime Dive Center, Dreamtime Dive Centre, Dreamtime Dive Resort, fire coral, flames, Holland America, Holland America Line, lobster, Mahahual, Mexico, photo, Photo Tourist, PhotoTourist, port, reef, Ryndam, scuba, scuba board, ScubaBoard, spiny lobster, the flames, the Photo Tourist, thePhotoTourist, tourism, tourist, trip advisor, tripadvisor, Underwater. You can follow any responses to this entry through the RSS 2.0 feed.